Back to mixing up parakeet food – and a $10 Amazon gift card giveaway! 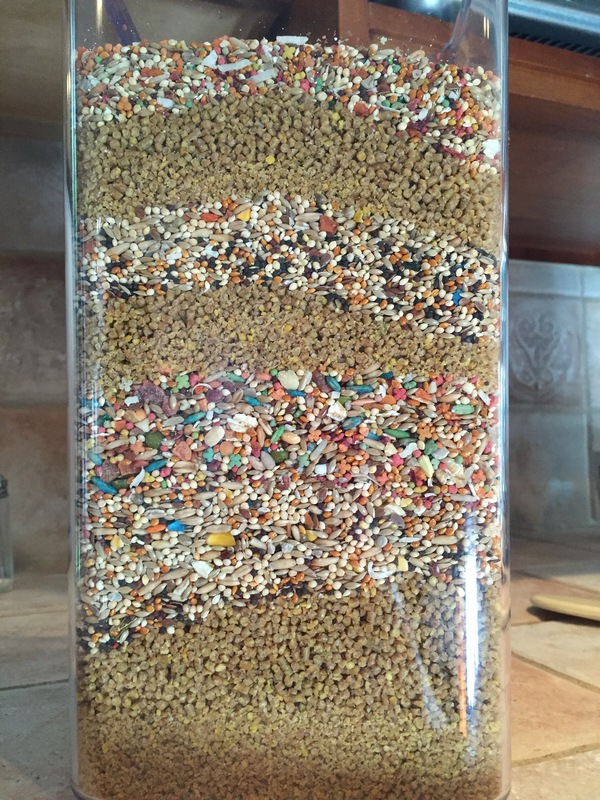 A while back I said that having found Dr. Harvey’s Parakeet Food I was all done mixing up my own blends of various seeds and pellets. It turns out I was a bit hasty when I made that grand statement and feeding parakeets is a moving target. The first couple of bags we got of Dr. Harvey’s Parakeet Food were perfect, and then over time they started being more heavily full of sesame seeds, which Toby and Kelly will not touch with a 10 foot pole. Initially I thought that they would get over it and learn to eat them, but instead they started fighting way more viciously over their food bowls. I thought that perhaps they were feeling more defensive about the food because there was less of it they found tolerable, so I quickly ordered a bag of Volkman Avian Science Super Parakeet and was glad of the reasonable price and my Amazon prime two day shipping. If you are shopping on Amazon then I definitely recommend you Try Amazon Prime 30-Day Free Trial , it’s magical being able to think I desperately need a new toy, perch, or food and have it show up just a couple of days later. (The link to the free trial there, like every other Amazon link on homekeethome is an affiliate link). My Volkman Avian Science Super Parakeet arrived and I offered some of it to the parakeets, they fell onto it immediately as though I had been starving them! 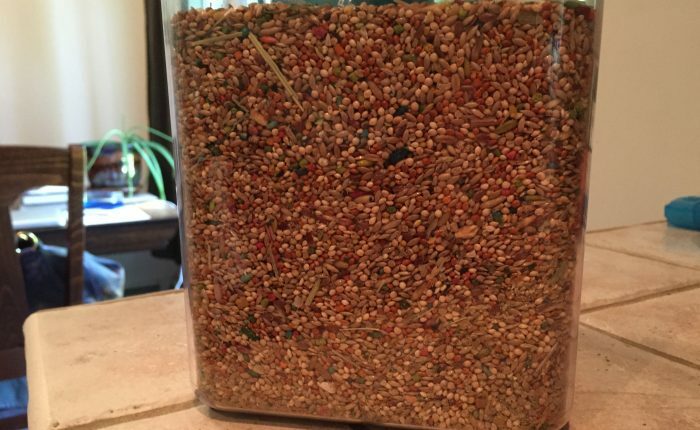 Apparently my sense of what was going on with the Dr. Harvey’s Parakeet Food was dead on, as I immediately started mixing the two seeds blends and saw a massive reduction in food-related violence. At about the same time, I put some Roudybush Daily Maintenance Bird Food, Nibles in the food cup on the parakeets’ play tree, not really thinking they would be into it, but Kelly went nuts for them! She would go out to the tree and camp out on the food dish, proceeding to chow down for a solid 10 minutes without pause. Since she liked it so much I thought I might as well start putting pellets back into their daily seed mix. And here I am, back to mixing together three different things to get them a good base diet, and of course offering vegetables and fruits regularly as well. On to the giveaway, which is sponsored by me out of the love I have for Amazon Prime and how much it helps me get what I need quickly without driving all over the place looking for preferred brands of food, toys and other supplies. I will contact the winner after the end of the sweepstakes, midnight, Monday 6/26 and will request the name and email address, prize will be a code emailed by Amazon.com directly. Open to the US only this time, 18 and over. Posted on June 20, 2017 June 20, 2017 Categories Products and Reviews, sweepstakesTags basics, feeding, necessities, new parakeet, parakeet health, pellets, review, seed, setup3 Comments on Back to mixing up parakeet food – and a $10 Amazon gift card giveaway! 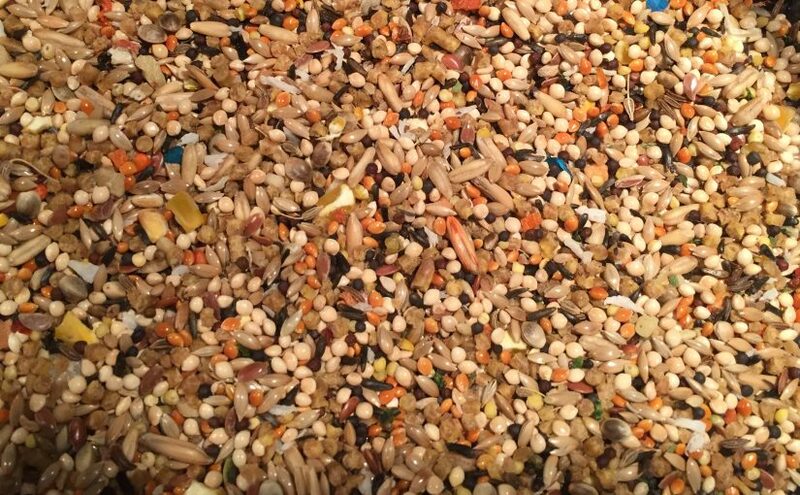 As you know, I like to mix up batches of various seeds and pellets to try to hit most of the parakeet’s dietary needs without taking away from their drive to forage. I’ve been running low on my current blend and wanted to try something new. I also needed to replace a storage container, I threw out the one pictured in my post about grain beetles in my seed both because someone put scotch tape on the interior and I couldn’t get all the residue off, and also I couldn’t get the idea out of my head that no matter how well I cleaned it, there might still be beetle eggs in there somehow. 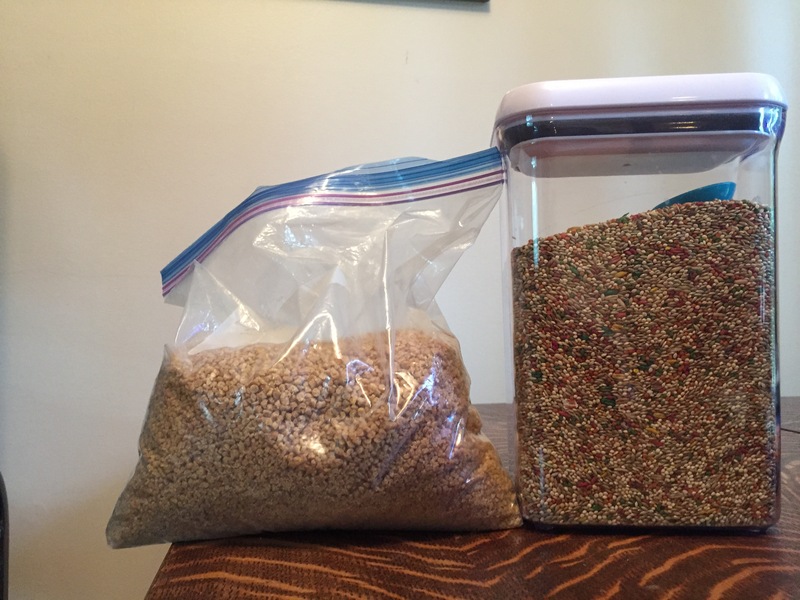 I purchased the OXO Good Grips POP Big Square 5.5-Quart/5.2 Litre Storage Container ; I had looked carefully at the dimensions, but it turned out to be way bigger than what I intended to buy. Down the road I may replace it with something easier to scoop out of, but for now it’s fine. I like that you get a really tight seal with the pop top, it seems much more airtight than a ziploc seal. 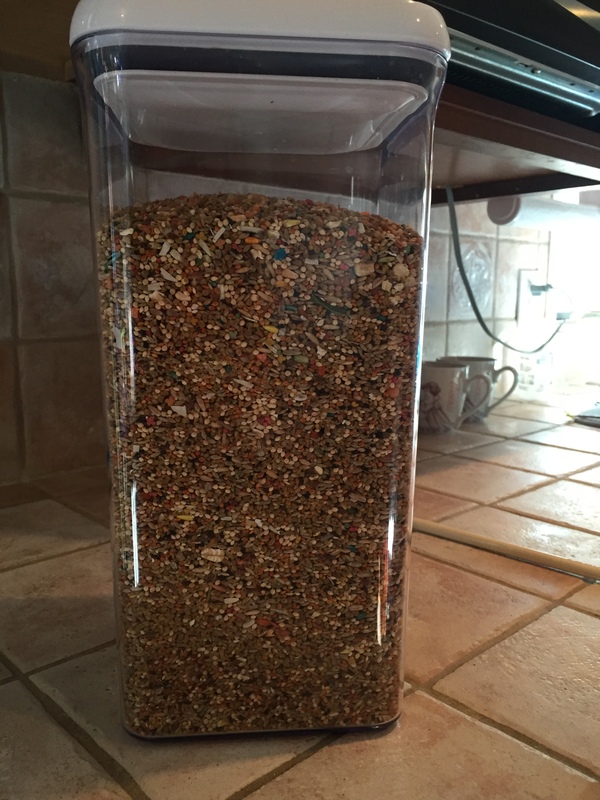 To fill it, I wanted to start with a base of Roudybush Daily Maintenance Bird Food, Nibles, 44-Ounce , because I do believe that pellets are an important part of the parakeet’s diet. Make sure to get the Nibbles size for parakeets, in my experience the Crumbles are way too big. 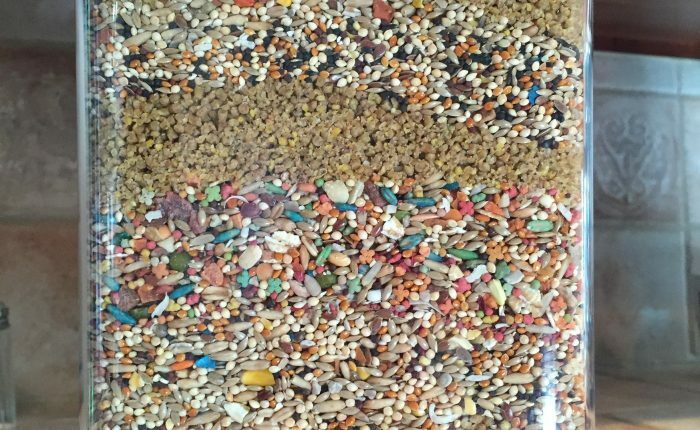 Next I looked for a new seed mix, I’m always on the hunt for the best food for the parakeets, and Volkman Avian Science Super Parakeet Bird Seed 4 Lb has some really great ingredients, and fabulous reviews. As soon as I opened up the bag I fell in love with the smell of this seed, it’s fruity and a little sweet, but very natural. I hand fed the parakeets some of it as I was putting this together and they took to it immediately. Sometimes it’s best to put in just a little of a new food mixed with old to make the adjustment easier, but I don’t have any concerns about them eating this at all. Finally, I wanted to add in something they’ve already been enjoying, the F.M. Brown’s Tropical Carnival Parakeet Food, 2-Pound . I know a lot of people use this blend just as a treat because there’s a lot of fruit, but I love to add it in to my every day mix. I don’t think my parakeets touch many of the interesting bits, so for us it’s just awesome foraging and exposure to different shapes and colors. And then I attempted to stir it up – which was a challenge because of the depth of the container. I worked at it with a long stirring spoon for a while and then had the genius idea to gently shake it up. I popped the lid shut and turned the container in all directions – including upside down, which is when this happened. As it turns out, the airtight lid is not strong enough to hold when turned upside down. Which probably should have been anticipated. No judgements please, but the floor had just been cleaned the day before, and I really didn’t want to throw away that much money, so we salvaged what we could and vacuumed up the rest. I’m excited to have a new mix and I’m guessing the budgies are going to love it – fixes for next time include a smaller storage container and less vigorous shaking! Before bringing home our first parakeet I had already decided that I would start Toby off on a seed-based diet, to make her transition from the pet store easier. There are so many conflicting reviews on Amazon that I ended up buying two well-rated seed blends and then mixing those together. They were F.M. Brown’s Encore Parakeet Food, 5-Pound and Kaytee foraging grassland parakeet. Those were going fine as far as Toby was concerned, but I started doing more research and read about how seeds are not sufficient nutrition for parakeets, not only are they full of fat but they also don’t have enough vitamins and minerals, and parakeets on a seed-based diet may have much shorter lives than those on a pellet-based diet. Of course as someone who just fell in love with parakeets the thought of consigning mine to an early death was horrifying! I immediately purchased a bag of ZUPREEM 230301 Fruitblend Small Keet Food, 2-Pound , which Toby ardently hated. She doesn’t really like fruit and won’t eat anything that has an unnatural color so it was a huge misstep. Back to the drawing board – and thank goodness these are all relatively inexpensive products, so it’s not a hardship to do some experimentation and I heartily recommend it. My next try was Roudybush Daily Maintenance Bird Food, Crumbles, 44-Ounce , which I thought was the smallest possible pellet available from Roudybush, although it turned out I was wrong (kind of a trend) and it was too big for Toby to deal with. So, I bought the Roudybush Daily Maintenance Bird Food, Nibles, 44-Ounce , and set out to convince Toby she should cut seed out of his diet. We began reducing the percentage of seed and adding in pellets at about a 50% ratio, but it just didn’t feel right cutting seeds out entirely. Doing some more research, I found that there’s not enough evidence for me that pellets are really nutritionally complete, and more than that, if it’s bad for me to eat a diet of processed foods, then why would it be good for my parakeet? I also started reading about how a pellet diet could be very detrimental to a bird’s mental health. Thinking about it this way, if someone told you tomorrow that you were just going to eat bland oatmeal every day, every meal, for the rest of your life, how would that go over with you? What do you think that would do to your overall happiness? Especially as it relates to parakeets, their beaks are designed to hull seeds and their bodies are designed to process them. It just doesn’t seem right to me to take that away completely. As it stands now, I’m feeding one tablespoon of Roudybush nibbles pellets per day with two tablespoons of Kaytee Forti Diet Pro Health Food for Parakeet, 5-Pound , this is doled out in two bowls and I discard everything every 24 hours. I know I’m throwing away a lot of pellets and unhulled seeds, but I’d rather know for sure that they have enough food instead of adding more on top of a pile of hulls. We do also offer a fruit or vegetable every day in addition to the pellets and seeds, they get some interest, hopefully enough to supplement their diet and provide some mental enrichment too. I haven’t gotten interested yet in going the homemade route, sprouting seeds and mixing up batches of super healthy ingredients, but check back with me in a year or so and I might be there. Until then, this is what we feed and so far so good! 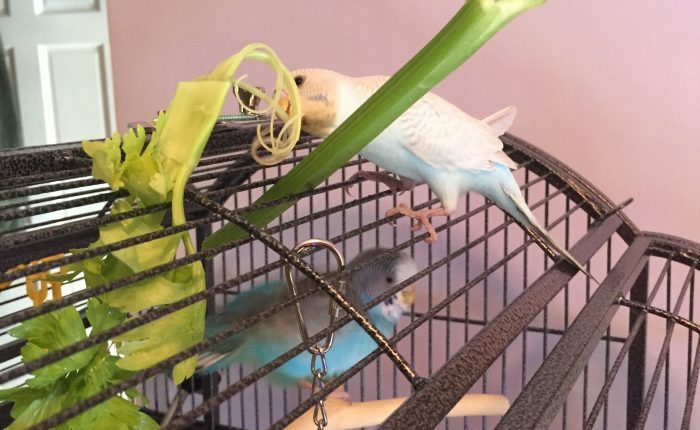 Ultimately, what to feed your parakeet is a very personal decision and everyone has to come to their own conclusions about what they think is best. Toby got a hull stuck in her throat in spring of this year and for about 24 hours I thought she was probably going to die. Thankfully we were able to help her dislodge it, but I walked away from that experience pretty adamant that we were switching to pellets and I would never look back. It didn’t stick, obviously, because I think that a life of just eating pellets would probably be so unsatisfying for her that the risk is worth it. Good luck to everyone making these choices, they are certainly not easy, and I can’t say that even now I think one way or the other is correct or “the best”, everyone can only do what feels right to them, and what works for their household. Posted on July 25, 2016 April 12, 2017 Categories Products and ReviewsTags beetles, feeding, pellets, seed1 Comment on What’s in my bird seed?